This is something fun made from Plexiglass sheet. 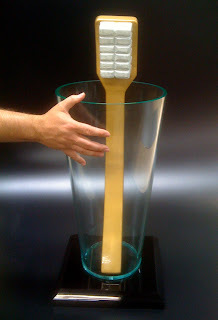 We had a customer come to us with this giant wooden toothbrush and ask us to make a matching glass for an advertising display. There is this whole world called the "ad specialty" industry that put people's logos on... well, anything. What makes plastic so fun (keep in mind that the word PLASTIC means: Capable of being shaped or formed: plastic material such as clay. See Synonyms at malleable.) is that with a little heat, imagination, time, and the proper forms - you can make anything.